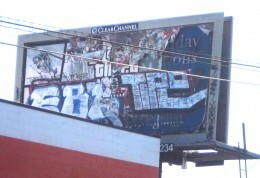 The graffiti on the backside of this billboard at 2520 S. Robertson Blvd. is in full view of the street, and has blighted its surroundings for at least a year, if not longer. The billboard, which currently displays an ad for KIIS-FM on its face, carries no company name or other identification, contrary to the L.A. sign ordinance. 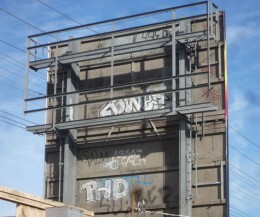 It would also seem that the unknown billboard company is in violation of the city’s anti-graffiti ordinance. In cases where property owners fail to remove graffiti, the code allows the city to remove it and charge the owner, including placing a lien on the property if necessary. Unfortunately, cases like the billboard on S. Robertson Blvd. are anything but isolated. 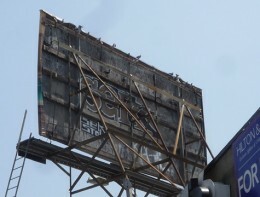 Major companies like CBS Outdoor, Clear Channel, and Lamar Advertising have failed to keep their billboards graffiti-free in many areas of the city.